Abstract | In this paper I present two views of Harley Parker, Marshall McLuhan’s longstanding collaborator. In the first I underline how Parker’s training in the arts as a typographic designer was put to work on the print projects for which he is best known, namely, on the original series of Explorations. I debate the claim that his work on Explorations 8 was not his own, and in this phase of argument I draw upon the legacy of other notable designers working in Toronto, namely, Allan R. Fleming of Cooper & Beatty Inc., the developers and promoters of Flexitype. Second, I resituate Parker’s link to installation and performance art in Canada by following the line established by his eldest son Blake Parker as resident poet of the experimental electronic band Intersystems, whose activities in 1967-68 included installations and performances at Perception 67 on the University of Toronto campus. The Mind Excursion psychedelic maze had its debut a few weeks after Harley Parker’s Hall of Fossils opened at the Royal Ontario Museum and marks the group’s origin proper. The connection between father and son is explored through the influences of elder Parker’s artistic proclivities as a painter, typographer, exhibition designer, critic, his collaborations with Marshall McLuhan, and the blend of McLuhan’s ideas, psychedelia, and kinetic art that animated Intersystems. Resume | Dans cet essai je présenterai deux perspectives de Harley Parker, qui pour un longtemps collaboré avec Marshall MacLuhan. Premièrement, j’explique comment Parker a utilisé son training typographique pour le travail dont il est plus connu, le journal Explorations. Je dirais que son travail sur l’Explorations est original et son propre en utilisant l’histoire des autres designers notables à Toronto, spécifiquement, les producteurs de Flexitype, Allan R. Fleming de Cooper & Beatty Inc. Deuxièmement, je désire à resituer le connexion entre Parker et l’exposition au musée d’art et le performance au Canada, par suivais la ligne de son fils, Blake Parker, et la groupe musique expérimentale d’Intersystems. Pendant 1967-68, cette groupe a performé dans un labyrinthe psychédélique, The Mind Excursion, durant l’évènement du Perception 67 à l’Université de Toronto. Le Hall de Fossiles de Harley Parker au Musée Royale d’Ontario a ouvert en janvier et quelques semaines plus tard The Mind Excursion a ouvert. Le groupe d’Intersystems a commencé avec cet évènement. J’explore les relations entre père et fils par voie des influences artistiques de Harley, et son collègue MacLuhan, et la combinaison la culture de psychédélique et l’art kinésique. Ces idées ont animé d’Intersystems. Harley Parker’s core career accomplishment was as Display Chief in art and archaeology at the Royal Ontario Museum (1957-67). He was co-conspirator and collaborator with Marshall McLuhan on print projects, journals, books, and films. Parker was visiting professor at Fordham University (1967-68) during McLuhan’s visiting research chair, and later held the post of William A. Kern Institute Professor of Communications at the Rochester Institute of Technology (1973-74). From 1967 to 1975 Parker was a Research Associate at McLuhan’s Centre for Culture and Technology at University of Toronto. However, he had worked out a non-stipendiary cross-appointment with the Centre as early as 1963, the year of its establishment. Fig. 1. Harley Parker and Marshall McLuhan, “Because print is a patterkiller,” section 12, in Explorations 8, ed. Marshall McLuhan and Edmund Carpenter (1955; repr., Eugene, OR: Wipf & Stock, 2016): n.p. © Estate Of Marshall McLuhan. © Estate Of Harley Parker. Used with permission. In this paper I situate the contributions of Parker along two connecting para-academic corridors of the Toronto School, focusing on graphical art and sound experimentation. The first refers to his design of McLuhan’s seminal communications journal Explorations, in particular, issue number 8 from October 1957 (Figs. 1 and 2). 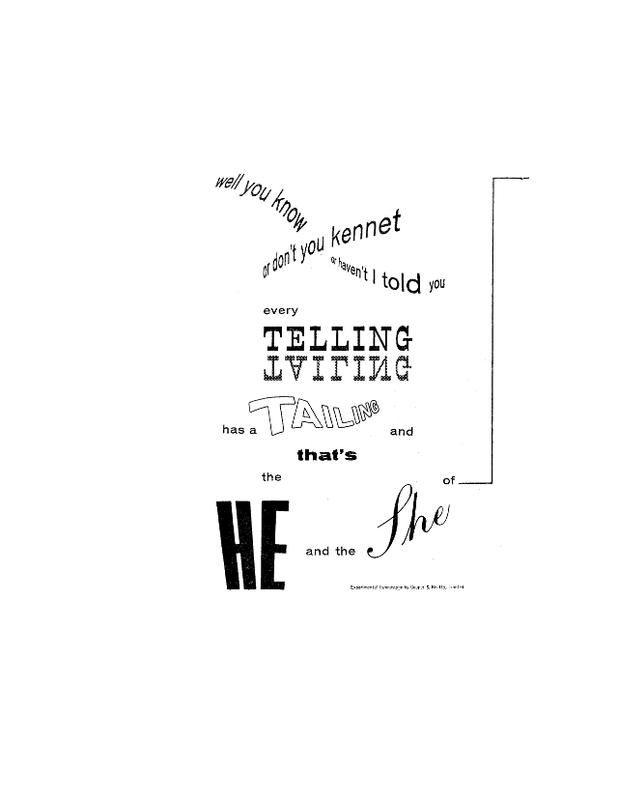 Although a few of the earlier issues involved Parker in several tentative experiments with the spatiality of the printed page and the plasticity of then new typographic methods, it was not until issue 8 that the results became substantive and influenced the look and feel of an entire issue. Transiting from the page to the built environment, Parker would become a trailblazer in museum installation, as his masterpiece of museum display, the Hall of Invertebrate Fossils at the ROM, attests. Students of Parker’s role in the Toronto School have observed that “perhaps the most literal application of Parker’s design theories was made by the Toronto art-and-music collective Intersystems, which included Parker’s son, the poet Blake Parker” (Lauder, “A Clash of Spaces”). However, it is productive to isolate two events in the aforementioned months in order to solidify this observation. The connection I make here is between the Parkerian page and performance spaces in which his son, poet Blake Parker, participated through his membership in the electronic music group Intersystems, with specific reference to installations of the group’s Mind Excursion structure, which debuted in the same year as the elder Parker’s opening of the Hall of Fossils. His agile movement from print to installation and back again solidifies Harley Parker’s legacy within the Toronto School. Fig. 2. 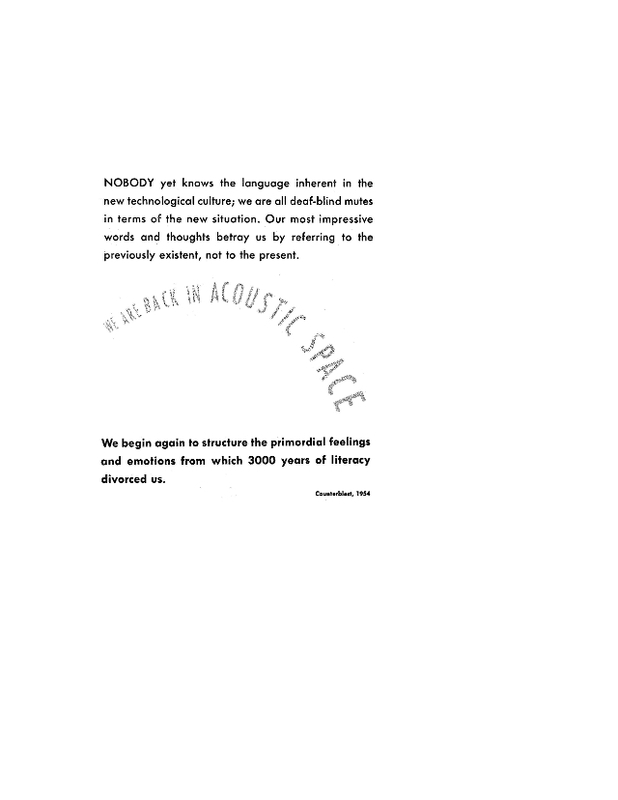 Harley Parker and Marshall McLuhan, “We are back in acoustic space,” section 14, from Explorations 8, ed. Marshall McLuhan and Edmund Carpenter (1955; repr., Eugene, OR: Wipf & Stock, 2016): n.p. © Estate Of Marshall McLuhan. © Estate Of Harley Parker. Used with permission. However, my approach is less concerned with the negative tropes of de-bookification and is more overtly and positively focused on the acoustification of printed pages. This is especially pertinent to Explorations 8 and the caper that accompanied the erasure of its colophon. 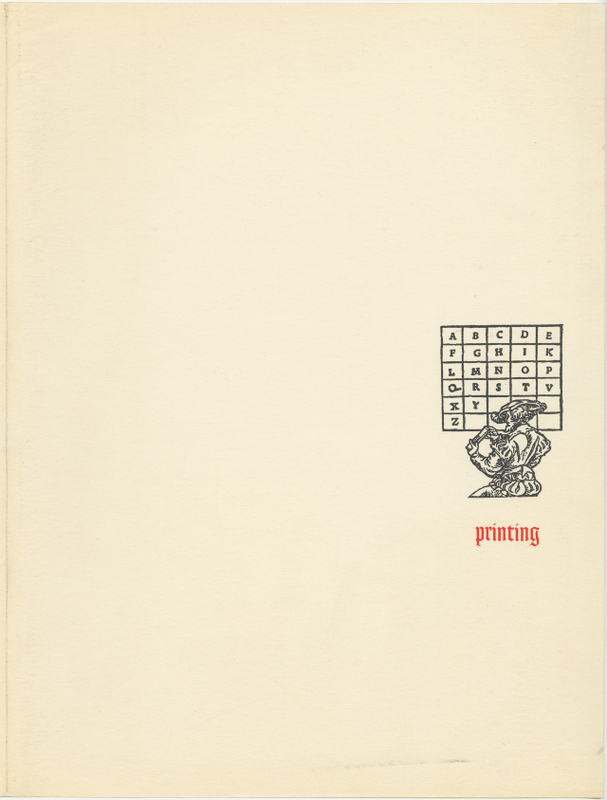 The augmented reprint of this issue ten years later in 1967 by Fluxus press Something Else—a rarity given that issues of Explorations have not been reproduced until 2016, with the exception of an anthology of selected essays that appeared in 1960—omitted the colophon of the original altogether. A colophon appears at the end of a publication and makes note of the design, typesetting, and printing details. Not incidentally, such details and notes, once regained, are not completely transparent, even though they provide insight into the details of production. The modification of Parker’s “original design” is acknowledged in the reprint. Parker rightly counted Explorations 8 in his portfolio of key design accomplishments, and his contribution has been noted in detail by keen observers of the journal such as Robert Fulford, who praised his “flamboyant and highly original typography” (“All Ignorance” 314). Parker was specifically acknowledged on the front page of the original issue, receiving credit for the cover and the interior, his choice of colour inks, and modified typefaces; the eight-page yellow section looks forward to the style of the “unknown” Explorations once it moved to the University of Toronto alumni magazine in 1964. However, it was not his first involvement with Explorations. He designed the cover of Explorations 7 earlier the same year, where it is briefly noted that the next issue will be “an experiment in photo-type designed by Harley Parker.” He also received credit for the Anna Livia pages in Explorations 5 (June 1955) along with colleagues Richard Grooms, Frank Smith, and Cooper & Beatty Ltd., which also gets a small mention on one page of the spread itself: “Experimental typography by Cooper & Beatty, Ltd.” This design brings into focus typical content from a descriptive colophon, which early issues of Explorations, with the exception of issue 8, for the most part integrated into “Notes on Contributors” and “Acknowledgements” or spread out on pages throughout the issue. Fig. 3. Harley Parker and Marshall McLuhan, “Anna Livia,” from Explorations 5, ed. Marshall McLuhan and Edmund Carpenter (1955; repr., Eugene, OR: Wipf & Stock, 2016): n.p. © Estate Of Marshall McLuhan. © Estate Of Harley Parker. Used with permission. What does the 1957 colophon tell us? The typography was known as Flexitype, expertise in which was provided by Cooper & Beatty Ltd. of Toronto. This use of Flexitype migrated from the world of commercial advertising and design to the academic publication process at University of Toronto Press, and it marks an alleged first—at least in terms of the concentrated quantity of its use, but also in relation to the high quality of printing provided by another outfit, Bomac Ltd. of Toronto—not to neglect the type of paper, Paragon Offset Brilliant, and the company that sold it, Provincial Paper Ltd. Together with the sponsorship note from the front matter indicating that the funder was the Toronto Telegram newspaper, there is an unusually rich array of information about products and businesses but not persons. The choice of the term “nominally” suggests that the reality is different from the official credit affixed to the journal. This involves two related events. The first is that Père Fleming’s catalogue essay for his curated exhibition, “The Development of Printing as an Art,” ends on a rather sour note as he points out the paucity of fine Canadian books for display in a Canadian setting, remarking that “the production of printers and publishers here are still at the level of England in mid-nineteenth century, a period not of bad taste, but of no taste at all” (“Development of Printing” 19). In the end, he found only one Canadian book to display. The cultural cringe of an accomplished Torontonian does not amount to a critical insight. The salient point is that Parker did not arrive at the ROM until September 1957, while the exhibition “The Art of Fine Printing” took place a year earlier in September-October of 1956. Although these dates do not support Martha Fleming’s claims, the second factor looms large. The product known as Flexitype was promoted by Cooper & Beatty through a substantive brochure with abundant typeface samples and glowing self-promotional discourse grounded in the machinic modernization of tradition; Fulford was an admirer of Fleming’s brochures for C&B (“Allan R. Fleming”). Flexitype was in the mid-50s a new photography-based typesetting that directly generated negatives rather than rely on relief surfaces on metal plates, and Cooper and Beatty promoted their advantage this way: “We’re proud to be the first company to introduce photographic typography to the printing industry across Canada” (“FLEXItype”). Beginning in 1955, the distorted typefaces that Parker utilized in Explorations were generated by placing a prism before the camera’s lens, captured in a photographic negative; Cooper & Beatty did this in-house using a photo-mechanical process. 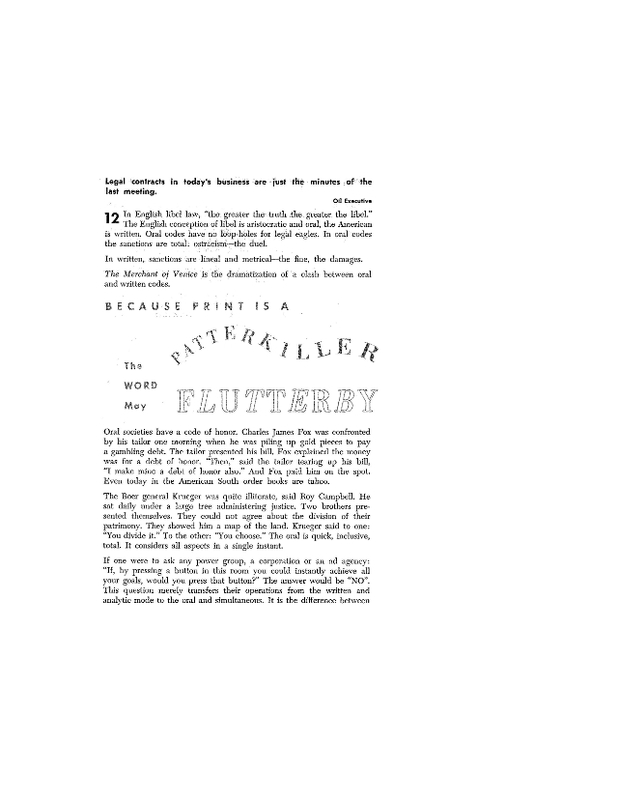 It seems likely that the advertising copy for Flexitype was the work of Fleming, as his repeated point of reference is Gutenberg, a curatorial interest. For instance, a typical piece of hyperbole: “Typesetting directly into film is the greatest advance in the development of graphic arts since Gutenberg first invented movable type” (“FLEXItype”). As a graphic design professional in Toronto, Parker seized the opportunity to experiment by crossing over from commercial methods to academic publishing, a process of de-specialization that was at the heart of his critique of the position of the curator and his public loathing for ‘POBS’—print-oriented bastards. Additionally, the yearly Typography exhibitions and lectures, at least from 1958-64, occasionally involved McLuhan, who guest lectured at the 1960 luncheon, and also Parker, as these exhibitions would have been his responsibility to mount as they occurred at the ROM (ie. Typography ‘58-‘59-‘60-‘61 and ‘64); moreover, Fleming designed invitations to the exhibits and arranged for OCA students to show their work in them alongside his own. McLuhan’s work was known among members of the Typographic Designers of Canada, especially Carl Dair. Parker and McLuhan tried to enlist Dair to design Through the Vanishing Point, but Dair would not take up the project and passed away in 1967, a year before the book’s publication. Fig. 4. Marshall McLuhan, “Printing and Social Change,” in Printing Progress: A Mid-Century Report (Cincinnati, Ohio: The International Association of Printing House Crafts- men, 1959), pp. 86. Graphic design and page layout (1958) by Allan Fleming (1929-1977), as Typographic Director, Creative Department, Cooper & Beatty Type Craftsmen (Toronto). © Estate Of Marshall McLuhan. Courtesy Clara Thomas Archives and Special Collections, York University. Used with permission. Martha Fleming astutely reminds us that it was her father who designed McLuhan’s paper “Printing and Social Change” for the 1959 report published by the International Association of Printing House Craftsmen, in Cincinnati. This remarkable publication is clear about attribution as each paper has a detailed colophon, including a personal reflection by the designer, who explains, in this instance, that he sought to “evoke a feeling of change in the reader” by means of a series of introductory pages consisting of wood cuts and a photograph and the title of the essay, a motif taken up in the page headers in the remainder, using red and black inks, and two colours of paper stock. Still, Fleming attributes the design to the collective efforts of all eleven Canadian Craftsmen clubs. Moreover, it is not Cooper & Beatty but rather the Society of Typographic Designers with whom Fleming identifies himself; C&B provided the type for the body and display elements, and preliminary printing and binding for the essay was done in Canada. Fig. 5. Marshall McLuhan, “Printing and Social Change,” in Printing Progress: A Mid-Century Report (Cincinnati, Ohio: The International Association of Printing House Crafts- men, 1959), pp. 887. Graphic design and page layout (1958) by Allan Fleming (1929-1977), as Typographic Director, Creative Department, Cooper & Beatty Type Craftsmen (Toronto). © Estate Of Marshall McLuhan. Courtesy Clara Thomas Archives and Special Collections, York University. Used with permission. Although Fleming and Parker were fourteen years apart in age and Fleming died young at the age of 48, they shared the C&B and the Eaton’s art department connections and both were OCA teachers. They both had, most importantly, McLuhan and University of Toronto in common, as Fleming joined UTP as chief designer in 1968 and later even designed protest signs for the Stop Spadina campaign in which Marshall was active; Parker had already joined McLuhan’s Centre as an associate. Both Parker and Fleming contributed design elements to Expo 67 and were active, one as curator and artist and the other as display chief, at the ROM during the years when Typography took place there. Typographic 58 was, as Fulford described it, a “one-man show” by Fleming who even designed the invitation card: “everywhere you turned in the small room in the Royal Ontario Museum in which the show was held, it is more than obvious that Canada’s first attempt at an annual typographic exhibit was dominated by the work of one man” (“Allan R. Fleming” 268). Ironically, Martha Fleming’s complaint is not so different from the absence of credit for display and installation in published records such as catalogues undertaken by Parker for much of his everyday ROM work. The important point is the confluence of design intelligence in Toronto in the late 1950s, with the commercial training and product innovation and C&B, its leaders such as Allan Fleming, design figureheads such as Dair, and the inter-institutional cooperation between the ROM, C&B, McLuhan, and University of Toronto Press. Everyone has heard about the summer of ’69, but I would like to revisit the winter of ’67, January and February to be precise. In the last week of January the elder Parker’s masterwork, the Hall of Fossils, opened at the ROM; in February, the building and opening of Michael Hayden’s Mind Excursion installation for Perception 67 took place at University College. During these two months the dailies in Toronto and New York were chewing over the Hall of Fossils’ opening, each trying to outdo in wit the McLuhan in/of the museum motif. Then Mind Excursion burst onto the Canadian arts scene as a strange psychedelic built environment that would catalyze the founding of Intersystems, help Blake Parker find his voice, and put Intersystems on the international map of kinetic art. The environmental impetus in kinetic art—which moves toward collapsing the space between work and spectator-participant, who is brought into close contact with movement, colour, and light, underlining psycho-physical experience in a defined and controlled space (Popper 204-7)—is shared with the Intersystems’ built environments, especially Mind Excursion, and the tools that Harley Parker utilized for the Hall of Fossils, including a range of invisible beams and pressure sensitive mats that triggered light and sound events, a low cloth ceiling, round walls, sand and shells on uneven flooring, a bank of wall-mounted dial-less telephones delivering recorded messages in lieu of typical didactics, and an acute aversion to labels and glass display cases. Parker’s goal was to make the “changing sensory orientation of the public” a key factor in inventive exhibition design, citing that much can be learned from “Go Go girls and the psychedelic event . . . [without] the misdirected enthusiasm of the hippies” (296). Sculptor Michael Hayden had successfully exhibited a number of kinetic pieces in Toronto and New York in 1966 at Gallery Moos and Martha Jackson Gallery respectively, and had begun collaborating with Blake Parker who contributed textual elements but had not yet begun to perform and record them himself. By 1967, Head Machine was shown at National Gallery of Canada; it featured composer Mills-Cockell’s soundscape and Parker’s recorded recitations, an “environmental container with its own sound and light systems and a timing device which programs the action of each piece in the whole,” but within an 8’ x 8’ x 8’ cube, (NGC, Intersystems and Lajeunie). Intersystems as a trio was born in February at University College (U of T) at the Hayden-coordinated Perception 67, a psychedelic event featuring visual art, music, poetry, and a range of countercultural luminaries. Mind Excursion was a built structure: a ten-room maze that heightened by parceling sensory experience into rooms by means of modifying floor and wall and ceiling surfaces augmented with various substances including chocolate, cotton balls, candy, and projections of images, with soft and hard substances for shoeless visitors, live dancers, low ceilings, and slanted floors. Given its room-to-themed-room sequentiality, a given trajectory would result in a series of experiential transitions rather than a true multisensual simultaneity. While McLuhan and partner Corinne attended the event, he was not on the bill. Mind Excursion was later reconstructed in 1968 in Montréal and included a Mindex Department Store selling packaged art objects, giving the notion of “exiting through the gift shop” an early referent (Reid 98). Mind Excursion is, however, a three-part work consisting of the soundtrack of the third Intersystems album, Free Psychedelic Poster Inside, and Blake Parker’s narrative for Mind Power, a collectively produced bilingual graphic short story borrowing from group members’ family photos (in addition to photographer Brian Thompson) of the courtship and marriage of fictional Gordie and Renée, an ordinary couple whose experiences indicate some of the excursion thematics (i.e., room of mirrors, confetti room, pastoral room). Hayden-Parker-Mills-Cockell first performed live together as the foursome Intersystems in Vancouver at the VAG’s spring 1967 event Direction 67, an “electrosonic” installation and performance in near darkness. Intersystems’ public presentations were enhanced when Mills-Cockell acquired a Moog synthesizer in 1968 and the machine became a performer in its own right, especially at its first appearance at the AGO in March 1968 during the band’s Duplex performance (later revisited at Carbondale courtesy of an invitation from Buckminster Fuller). The band acquired new member architect Dik Zander, who had been active already with Hayden during the construction of Mind Excursion. Duplex is again architectural in inspiration, with Mills-Cockell and Parker (voice and sound) on the ground floor, and Zander and Hayden (lights and projections) upstairs. Parker recites a tale of an ordinary duplex, with laundry machines and framed diplomas. This motif would become progressively darker as Parker troubled domesticity and suburban life (“Intersystems” 89). Parker was a poet of the everyday, of the foreboding ordinary. Intersystems would only survive until early 1969 after their performance of Network II at the Masonic Temple in Toronto. While a case can be made for broad overlapping extra-psychedelic themes in Parker’s late 1960s collaborations with McLuhan in print and film media (“Intersystems” 84), when Blake Parker found his voice and began performing his poetry for Intersystems—as it had hitherto been rendered and recorded by others, a fact he allegedly disliked according to Hayden (26)—then a controlled exploration of integrated multi-sensory elements emerged and the possibility of taped performances within the plastic elements of custom designed and built environments could take place: Blake Parker moved from published poet to spoken word performer, making kinetic art, records, and performing live, sometimes within the structures themselves (i.e. Duplex 1968). Of course, in its initial incarnation Mind Excursion only stood for two days, a far cry from the long run enjoyed by the Hall of Fossils. While Hayden had insisted on exploring olfactory differences amongst the “programmed” rooms of Mind Excursion, Harley Parker once joked that it would have been appropriate to infuse the entire Hall with the smell of rotting fish to augment the bird, storm, and other sounds and recorded voices, both thundering and quiet, not to mention flashing lightning and film projection of a wave overhead—in the process de-emphasizing the graphical and eshewing naturalism for abstraction in pursuit of a carefully deduced audience whose role would be to “operate” the gallery. The Hall of Fossils is certainly less boxy and more sensorily integrated than Mind Excursion, with its calculated sequential changes and hyper-concentrated atmospheres. Still, the Hall relied on standard built motifs of museum design such as dioramas and borrowed the semi-circular ambulatory from church architecture (Medieval Modern 164-65). Mind Excursions’s rhetoric of programming and its floor plan, viewed from above in standard architectural bias, may have forced sensory experience into tight spaces and thus intensified it without reflecting on the control elements of interplay imposed by both design and institutional factors. By the end of the 1960s, Harley Parker had returned to typographic experimentation and book design in the rollicking pages of McLuhan’s Counterblast (1969). Counterblast can barely contain the Lewisian eruptions of print, and the niceties of print craft are gone—no more colophons and no more nods to the ink and paper producers. The designer’s name is actually on the cover, in capital letters, fixing identity and authority, a hard-won acknowledgement that uses its power in the pages of the book to disorient and disrupt in grand gestures of de-signifying glitches and the construction of word-objects whose stability goes only as far as the foreign translations that of necessity remake and remodel them. What Parker taught us about print culture is that a page is a process, sped up by translation, slowed down by a redesigned reprint. Furthermore, as he wrote with McLuhan in the preface to Through the Vanishing Point, “labels as classification are extreme forms of visual culture” (xxiv); a gallery that limits the use of labels and transforms them into recorded messages and projections erodes stable visuality for the sake of new movements and relations. Blake Parker took opportunities for releasing new intensities when he decided to record his own poetry for art works and to perform it live, becoming the “singer” in an experimental band. Harley Parker, in moving Flexitype from a commercial to an academic context, initiated novel intensities of aesthetic and conceptual relations, building pages like environments with all of the special effects available at the time. In opening up the space of the printed page, Harley Parker also addressed the transition from the visual bias of illustration to the synaesthetic icon as a way of understanding the predicament of serials in the post-literate age that typically include both. He tried to make his design work in print and in natural history galleries more iconic, breaking up large masses of grey type dynamic flourishes reduces word counts, suggesting that writing will need to become increasingly non-sequential. Exposition will proceed in clusters rather than sequentially. Phototype will flourish, and sound will be invoked in a myriad of ways. Parker was imagining a post-typographic practice akin to the post-labeled artifact in the museum setting; the immersive psychedelic environments that concentrated elements borrowed from kinetic art practices. Fig. 4. Marshall McLuhan, “Printing and Social Change,” in Printing Progress: A Mid-Century Report (Cincinnati, Ohio: The International Association of Printing House Crafts- men, 1959), pp. 86. Graphic design and page layout (1958) by Allan Fleming (1929-1977), as Typographic Director, Creative Department, Cooper & Beatty Type Craftsmen (Toronto). © Estate Of Marshall McLuhan. Used with permission. Cruchley, Brian. “Headline freak out at U of T.” The Telegram (Toronto) (January 1968 12): np. Dipede, Cheryl. “From Typographer to Graphic Designer: Typography Exhibitions and the Formation of a Graphic Design Profession in Canada in the 1950s and 1960s.” RACAR 40/2 (2015): 130-45. Fleming, Allan R. “The Development of Printing As An Art.” In The Art of Fine Printing And Its Influence Upon the Bible in Print. Toronto: Royal Ontario Museum (Sept 11-Oct. 13 1956), pp. 11-19. Fleming, Martha. “Allan Fleming: The man who branded a nation.” Eye 79/20 (Spring 2011). Accessed online via Google cache: http://www.eyemagazine.com/feature/article/allan-fleming-the-man-who-branded-a-nation. Fulford, Robert. “All Ignorance is Motivated.” In Marshall McLuhan: Critical Evaluations in Cultural Theory, Volume 1, Fashion and Fortune. London and New York: Taylor & Francis, 2005, pp. 307-16. — “Allan R. Fleming.” Canadian Art XVI/4 (November 1959): 266-73. Hayden, Michael. “How the Mind Excursion came to be.” In Intersystems [booklet of vinyl resissue package]. Milan: Alga Marghen, 2015, pp. 21-34. Kessler, Jascha. “McLuhan Nonbook Nonenlightening.” Los Angeles Times (17 November 1968): D52. McLuhan, Marshall. Counterblast. Toronto: McClelland and Stewart, 1969. 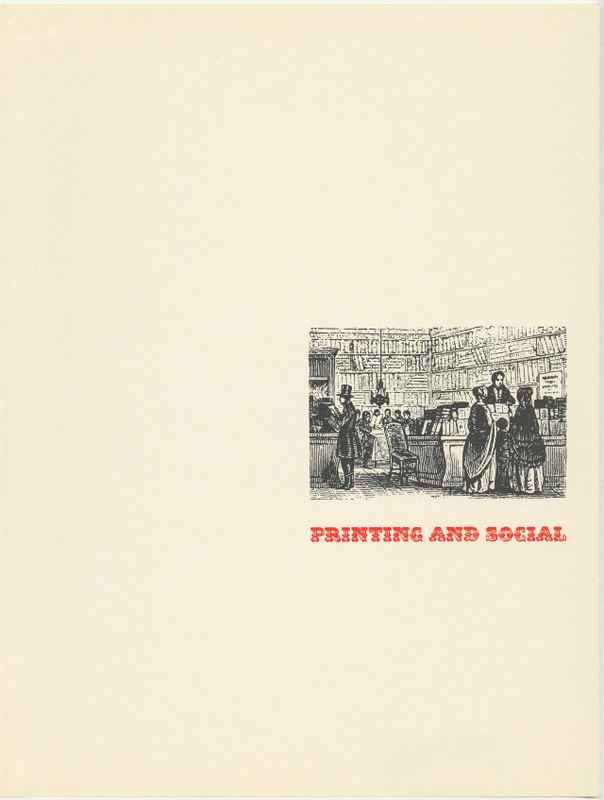 — “Printing and Social Change.” In Printing Progress: A Mid-Century Report, ed. Clifford L. Helbert. Cincinnati: The International Association of Printing House Craftmen, Inc., 1959, pp. 89-112. McLuhan, Marshall, and Parker, Harley. Through the Vanishing Point: Space in Poetry and Painting. New York: Harper & Row, 1968. Nagel, Alexander. Medieval Modern: Art Out of Time. London: Thames & Hudson, 2012. National Gallery of Canada. Intersystems and Lajeunie (catalogue). Ottawa: NGC, 1967-68. Parker, Harley. “New Hall of Fossil Invertebrates Royal Ontario Museum.” Curator X/4 (December 1967): 284-96. Popper, Frank. Origins and Development of Kinetic Art. London: Studio Vista, 1968. Reid, Dennis. “Intersystems, 1967-69: Radically Rethinking Art.” In Intersystems (booklet). Milan: Arga Marghen, 2015, pp. 93-99. Schnapp, Jeffrey T. and Michaels, Adam. The Electric Information Age Book. New York: Princeton Architectural Press, 2012. Theall, Donald. Understanding McLuhan: The Medium is the RearView Mirror. Montreal and Kingston: McGill-Queen’s University Press, 1971. This article is licensed under a Creative Commons 4.0 International License although certain works referenced herein are separately licensed, or the author has exercised their right to fair dealing under the Canadian Copyright Act. Figures 1, 2, and 3 © Estate Of Marshall McLuhan. © Estate Of Harley Parker. Figure 4 and 5 Figures 1, 2, and 3 © Estate Of Marshall McLuhan.